Please refer to our stock # B-18 when inquiring. 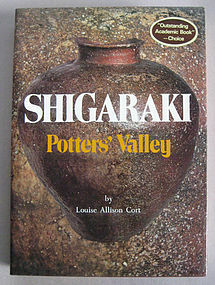 "Shigaraki: Potter's Valley" by Louise Allison Cort. 1981 second printing. Clothbound hard cover with original dust jacket. Condition - New. 428 pages, 52 full color photographs and more than 300 B/W photos encompassing both the great variety of Shigaraki wares and the techniques and processes still in use today. Louise Allison Cort, formerly assistant curator of Oriental Art at the Fogg Museum, is a craft historian and the recognized Western authority on Shigaraki ware. "Louise Cort's vision of the history of Japanese ceramics is historically precise and informed with profound insight into aesthetic and social values. No Westerner has probed as deeply as she into the history of Japanese craft traditions or into the processes by which that nation's cultivated intelligentsia came to cherish the products of rustic artisans." John Rosenfield, Professor of Oriental Art, Harvard University.